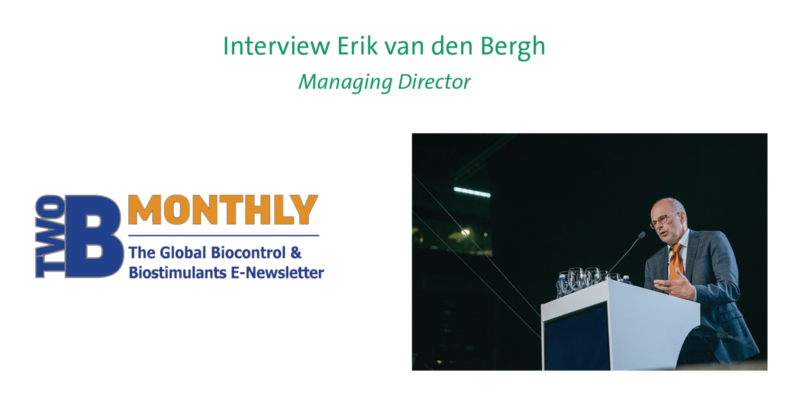 Our Managing Director Erik van den Bergh was recently interviewed by New Ag International for their TwoBMonthly newsletter on Biostimulants. He shared the vision of Van Iperen towards biostimulation in fertilizers and some interesting innovations that are in the pipeline. Read the full interview below. You are defining your company as a Dutch producer of specialty fertilizer solutions for fertigation and foliar application, combining your knowledge in mineral fertilizers with the opportunities of biostimulation, creating innovative products “Where Nutrition meets Biostimulation™”. When did you start showing interest for biostimulants? In fact, this strategy started from the early beginning of Van Iperen International; we spent our first several years for R&D in this field to be sure that the products we launch are really “value for money.” We then launched five years ago the first formulas of liquid fertilizers including seaweed. And today, thanks to our R&D, we have under our trade name FoliaStim® a complete range of Algae Solutions, combining nutrition and biostimulation. Soon after, we launched the Iperen IPE® Technology for Increased Phosphate Efficiency. This patented technology has great potential on all the degraded soils and soils with low or high pH, like China, the Mediterranean region, Australia and South America. Looking at your biostimulants product line, it is obvious that your main commercial interest, at least at this stage, is to deal exclusively with raw materials, let’s call them the biostimulants 1.0, namely seaweed extracts and humics, combining them with nutrients. Is this a definite policy to only propose products that combine nutrients and biostimulants? This is for us a first step towards the future generation of new nutrition solutions. Our company expertise is plant nutrition. We believe that the added value Van Iperen International can bring in biostimulants is to work on the synergism with crop nutrients. That is why this is our primary focus. The current, first generation biostimulants will soon be followed by more novelties from other (vegetal) sources with more specific and stronger biostimulation. Our R&D works mainly in this field. However, the first generation biostimulants have lots of room to develop, with new formulations and synergism with other additives etc. Your Humic Acids source is processed via a unique extraction method. Do you have direct access to this resource and have you developed this extraction method or is it just part of a package you acquire through a partner supplier? In the Netherlands, we do not have this resource so we have indeed a global partnership with a U.S.-based market leader with a recognized top quality Humic Acid source. We also are their sole REACH registered partner for the European market. We believe in such partnerships where Van Iperen brings the market and agronomical know-how and formulation technology. Why do you not include amino acids to your product line? There are too many other exciting molecules to develop and amino acid is widely available, so we have little to contribute. Can you talk about Iperen WAKE-up®, one of your New Solutions products? Iperen WAKE-up Liquid is cutting edge, belonging to the new generation of Van Iperen products. After four years investigating and developing together with Landlab our R&D partner, we can claim that Iperen WAKE-up® Liquid can perfectly summarize our motto “Where Nutrition Meets Biostimulation™”. It has been specifically developed to provide to the growers a solution to improve fruit quality especially under dry conditions. You have recently announced the signing of a business and marketing partnership agreement with Acadian Plant Health™ (APH™). Can you enlighten us on the nature of this agreement? Acadian Plant Health™ is a world leader in marine algae based biostimulants with great knowledge in their application to overcome stresses and improve grower programs and crop results. Several years of successful collaboration has blossomed into a close working relationship and to the signature of an international marketing agreement. In this partnership, we are also developing together new solutions formulated at our production sites which might be marketed by either us or Acadian. Your innovations department is working on screening and testing different molecules and substances. From the start of Van Iperen, you have been working closely together with Landlab, an Italy based R&D center in agriculture. Can you tell us a bit more about these new molecules and substances? Our innovation department is investigating certain plant extracts for their biostimulating activity. We already have observed interesting results in trial programs and expect it will lead to the introduction of next generation biostimulants with very specific mode of action in the next two to four years. Your company has grown impressively over the years. You are now selling in 100 countries. Where do you see the most potential for your products in the future, in particular those combining nutritional and biostimulation properties? We see potential on all continents but to mention one, we have just opened our Miami office and foresee fast growth in the Americas. Is the field of biocontrol a business segment which you may be tempted to enter, possibly by acquisition of an existing supplier or R&D platform? Biocontrol is definitely an interesting field to enter, however currently we have no plans to enter this field but put all our focus on plant nutrition and how to overcome abiotic stress. But we may come across opportunities in the future and review our position. You mentioned recently that you want to double your sales turnover within a few years. As consolidation continues in the sector, do you see external growth by means of acquisition as an interesting growth option for Van Iperen International? Our focus is on internal growth by our own means and R&D. All our resources are currently put into this direction as we believe to have several potential winners in our R&D pipeline. Acquisitions are therefore not on our agenda.